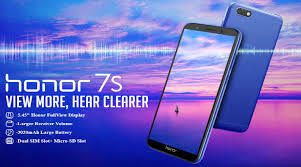 Honor brand launched its latest budget Smartphone Honor 7S in India. It is worth noting that this phone has already been launched in Pakistan. On the other hand, the company already has budget smartphones like Honor 7A, Honor 7C and Honor 9N in the market. Talk about the important features of Honor 7S, it includes 18: 9 HD + display, 5-megapixel selfie camera, soft LED light and 3020 mAh battery. Let's now tell you about the price and availability of Honor 7S. The only variant of Honor 7S 2 GB RAM and 16 GB storage is offered. It will sell for Rs 6,999. The smartphone will be available exclusively at Flipkart. Apart from this, the company will also be available on its website. The phone will be made available in Black, Blue and Gold colors. The first sale of Honor 7S will be at 12 noon on September 14. Dual-SIM Honor 7S Out of Box will run on Android 8.1 Orio. The 4G network will work in the first SIM slot of this phone. The phone has a 5.45 inch HD + (720x1440 pixels) TFT full view display. This is a screen with an 18: 9 aspect ratio. Its pixel density is 295 pixels per inch. The smartphone has a quad-core media tech MT 6739 chipset. 2 GB RAM has been provided for Jugalbandi. Inbuilt storage is 16 GB and if needed, up to 256 GB MicroSD card can be used. Honor 7S has a 13-megapixel rear camera. It is equipped with phase detection autofocus, F / 2.2 aperture and LED flash.